In These High, Green Hills we’re once again in Mitford, a southern village of local characters so heartwarming and hilarious you’ll wish you lived right next door. At last, Mitford’s rector and lifelong bachelor, Father Tim, has married his talented and vivacious neighbor, Cynthia. Now, of course, they must face love’s challenges: new sleeping arrangements for Father Tim’s sofa-sized dog, Cynthia’s urge to decorate the rectory Italian-villa-style, and the growing pains of the thrown-away boy who’s become like a son to the rector. Add a life-changing camping trip, the arrival of the town’s first policewoman, and a new computer that requires the patience of a saint, and you know you’re in for another engrossing visit to Mitford — the little town that readers everywhere love to call home. This is the third book in the Mitford series. I really enjoy this series. The author has done a great job making you feel like you are right there living in the middle of small town America. This is fun and easy series to read. It is the type of series I would read on vacation or in front of a fire in the middle of winter. I did enjoy books one and two a little better than this third one. But it is still a series I love and I look forward to reading book four. 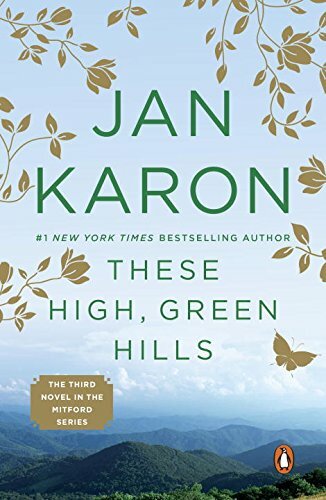 My review of Book 1 At Home In Mitford and Book 3 These High Green Hills.